In the summer, a hot dog is both a ballpark staple and a veterinarian’s nightmare. Halloween is almost here, and though you might get a kick out of the adorable witches and ghosts who come trick-or-treating to your door, your dog or cat may not be as thrilled. Don’t let October 31 become your — and your pet’s — worst nightmare. No one wants to spend Halloween night looking for an escaped pet or rushing to the vet ER. Here are five Halloween hazards for cats and dogs — and what you can do to prevent them and keep your animal safe. 1. Keep Costumes Comfortable and Safe Your pet might look adorable as Elsa from Frozen, but if your dog or cat paws at or squirms in her costume, she probably doesn’t want to wear it. If your pet doesn’t seem averse to being dressed up, make sure his costume fits well, can be seen in the dark, and doesn’t have buttons, threads, beads or ties that can be chewed off. Supervise your costumed pet at all times and limit the amount of time he wears the outfit. 2. Watch for Escape Artists The constant ringing of the doorbell combined with trick-or-treaters in masks and costumes can be stressful and scary for pets and cause them to react badly or even dash out the door. Keep your dog on a leash or in his crate. If you have a cat, keep him in another part of the house or in a closed room or crate. And no matter what precautions you take, make sure your pet is wearing a collar with proper identification, and, if he’s not already, you should consider getting him microchipped. After the Fourth of July, Halloween is the second most common night of the year for pets to escape, so be extra vigilant. 3. 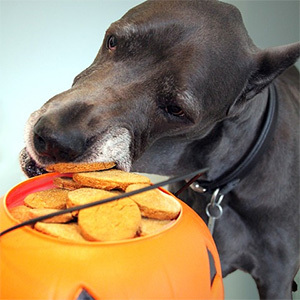 Keep Candy Away Keep all sweets out of your pet’s reach. Chocolate, especially dark chocolate, can lead to stomach upset or even life-threatening situations for both dogs and cats. Sugar-free candy is also a risk, as it may contain xylitol, which can cause low blood sugar and liver damage in dogs. 4. Beware of Dangerous Decorations Halloween decorations are festive and fun, but some can be risky for pets. A cat or dog can easily knock over a lighted jack-o’-lantern, potentially causing a fire. So use a battery-operated candle or flashlight in your pumpkin instead. And while you’re at it, keep edible decoration out of reach. Consuming large quantities of pumpkin or decorative corn can cause vomiting and diarrhea in pets. Scary decorations that make noise and have flashing lights also can upset animals, so be mindful of your pet if you choose to display them. And it’s a good idea to secure stringed lights or electric cords – pets can chew on or get tangled in them. 5. Let Your Dog Stay Home It might seem like fun to take your pooch out trick-or-treating, but it could quickly turn into a nightmare. Flashing lights and unexpected sounds can alarm your pet, potentially creating a troubling encounter between an overexcited dog and the neighborhood kids. Do everyone a favor by leaving your dog at home.